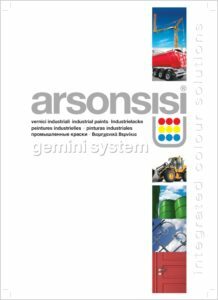 Arsonsisi’s successful innovation in the tinting system market for industrial coatings is called GEMINI SYSTEM, a product philosophy that provides the industry with the opportunity to choose between two ARSONCOLOR systems, created on the basis of a same logic and shared assumptions that ensure continuity of quality and performance, while marking a real generational shift. 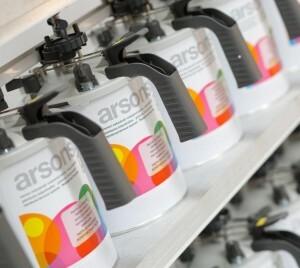 ARSONCOLOR SYSTEM and ARSONCOLOR HYDRO SYSTEM are two multipurpose colorimetric systems with the same selection of colour pastes and the same concentration of pigments. 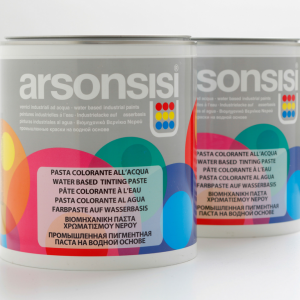 ARSONCOLOR SYSTEM is the traditional solvent-based line while ARSONCOLOR HYDRO SYSTEM is the innovative water-based line, created to meet the growing demand for high-quality, low-emission coating systems. Colour mixing becomes a real commodity for those who adopt the GEMINI SYSTEM philosophy, allowing them the freedom to choose which line to work with. The common approach shared by the two systems makes it possible to manage unified colour formulations, with the confidence to achieve the same excellent results.